José Sarmento Matos, is a Portuguese documentary photographer based in London and a Leica Akadamie Ambassador. In December 2014 he completed an MA in Photojournalism and Documentary Photography at the LCC, where lectures now on the BA and MA Photojournalism and Documentary Photography courses. José is interested in covering stories about the current social uncertainty in Europe and other parts of the world. As well as analysing relevant contemporary world issues by focusing on people’s personal stories, he also focuses his work on his diary photography, documenting what's around his day-to-day life. José is a frequent contributor to The New York Times. He has also published his personal projects in outlets world wide including Newsweek, Financial Times, WIRED, The New Yorker. The New York Times, Süddeutsche Zeitung. Other clients includes, A+E Networks, HISTORY channel, Huck Magazine, Expresso, Jornal Público, Noticias Magazine, Aljazeera, Microsoft, Victionary, and Leica. In 2015 the Portuguese Photographer was named one of the winners of “30 under 30” Magnum award for ‘Young Documentary Photographers’ with his project ‘Turning The Page’. Developed in Portugal, the project focuses on the change in individuals who have been traumatised as a result of violent crimes. This project was also in exhibition in different galleries in Portugal, from November 2015 until late 2016. JSM´s work has been exhibited in galleries and other venues in other cities such as London, Oslo, Berlin, Birmingham, Stavanger and Paris, and was a member of Project Sea Change; a documentary collective about today’s young Europeans and how they are dealing with the social and financial crisis in Europe. The Sea Change photo book was published in January 2015. “Brexit on the Rock - Gibraltar” - Photo Scratch. London, United Kingdom. (05-2018). “How Can I help You?” - Espaço Santa Catarina, Lisboa, Portugal. (09-2017). “Turning the Page” - Edifício dos CTT, Ponta Delgada, Açores, Portugal. (07- 2017) - (08-2017). “How Can I help you?” - Photo Scratch. London, United Kingdom. (11-2016). “Turning the Page” - Espaço Atmosfera M, Porto, Portugal. (04-2016). “Turning the Page” - Espaço Novo Banco, Lisboa, Portugal. (11-2015) - (02-2016). “Project Sea Change” - Literaturhaus, Vienna, Austria. (10-2015). Dysturb - 70th anniversary of the United Nations. France. (10-2015). “Project Sea Change” - Stavanger Kulturhus, Stavanger, Norway. (09-2015). “Magnum 30 under 30” - The Photography Show, The NEC. Birmingham, United Kingdom. (03-2015). “Project Sea Change” - The House of Literature, Oslo, Norway. (01-2015). “Consider this” - Final show of MAPJD 2014 students. London, United Kingdom. (01-2015). Project Sea Change - Sold out. “30 under 30” Magnum award for ‘Young Documentary Photographers’ with project “Turning The Page”. January 2015. 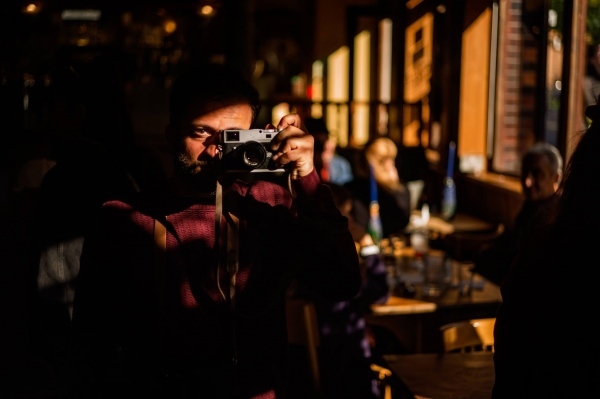 London photo essay competition, Financial Times. With project Chasing London. September 2014. Associated Lecturer at London College of Communication, UAL. Teaching BA and MA Documentary Photography and Photojournalism. (11/2015 - CURRENT). Leica Akadamie Ambassador (09/2016 - CURRENT). Photojournalist Intern, Público Newspaper, Portugal, Lisboa. (04/2013 - 08/2013). Photographer, ALPINE PHOTOSHOP, Zermatt, Switzerland. (07/2012 - 03/2013). University of the Arts London. London College of Communication, Photojournalism and Documentary photography - MA, London United Kingdom. (2014-2015). Universidade Católica Portuguesa, Media Studies and Communication — BA, Lisboa, Portugal. (2007) - (2010). Universid Ramón Llull, Media Studies and Communication — Bachelor / Erasmus, Barcelona, Spain. (09-2009) - (02-2010). Queensland International Business Academy, Academic English, IELTS — Coolangatta, Australia. (09-2010) - (02-2011).